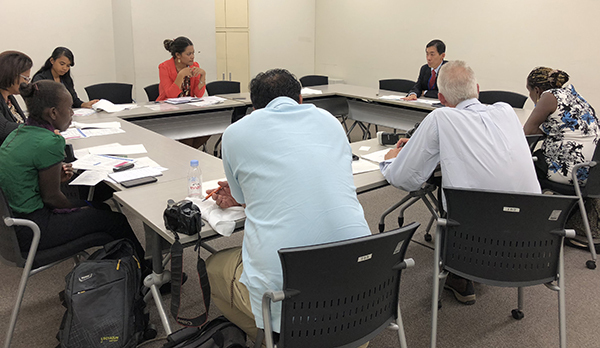 Pohnpei—Japan’s Ministry of Foreign Affairs (MOFA) invited eight Pacific Islands Journalists at Japanese government expense to cover the recently concluded PALM 8 in Iwaki, Fukushima. The journalists were free to report on the events without censorship. The journalists came from the FSM, Tonga, Samoa, Fiji, Solomon Islands, Palau, Papua New Guinea, and the Marshall Islands. As journalists the participants had widely varying levels of experiences with some veterans and others who were just beginning their journalistic careers. Their ages ranged from 20 to 55. They were Polynesian, Melanesian, Micronesian and even one long-time resident American but they had in common a love for the Pacific region and the issues that affect their everyday lives in their home countries and a desire to better understand the relationships and the complicated processes of negotiations between their small island countries and with Japan. MOFA, through its contractors and employees ensured that journalists’ needs were covered from the basics all the way up to helping to organize interviews with government officials or arranging side visits when that was possible. Because of flight schedules, some journalists arrived earlier than others. Others departed later but most journalists were left with at least some free time either before or after the PALM. Some journalists like me chose to spend some of that free time on their own. I chose to visit cultural sites with my cameras, negotiating the Tokyo train system for the first time unaccompanied. The Tongan journalist chose to spend his advance free time interviewing a Tongan rugby player now playing in Japan. Others stayed with the group. MOFA was accommodating to most wishes and organized tours including a tour and information on the towering Tokyo Sky Tree. Though I arrived on Sunday evening, May 13, the program didn’t begin in earnest until the morning of May 15. It began with a program orientation briefing in an MOFA conference room, followed by a briefing on Japan’s Initiative on Climate Change. Even lunch had a purpose. We were taken to a restaurant run by Kinki University where all of the fish we were served was harvested from fish farms in innovative ways. After lunch there was a briefing by Country Assistance Planning Division of the International Cooperation Bureau and JICA on Japan’s official development assistance to the Pacific Island Countries, assistance policies, outcomes and future perspectives. The day ended with a briefing on the objectives and motivations for the PALM 8 from the perspective of Japan. The next day began with a briefing at the Reconstruction Agency on reconstruction efforts, seven years after the devastating earthquakes and tsunami that killed over 19,000 people. Over 6,000 people were injured and over nearly 2600 were missing. Over a million buildings were damaged; over 10,000 that were completely collapsed, 280,000 that were partially collapsed and nearly 750,000 that were partially damaged. Many people have yet to return to their homes even these seven years later, and 2.7% of Japan’s third largest prefecture cannot due to the melt down at the Fukushima Daiichi Nuclear Power station. The damage from that meltdown has far reaching economic consequences for the reputation of products coming from Fukushima. The Japanese government has established stringent measuring standards for radiation for products from the prefecture that far exceed the safety levels of most countries. Still, there is skepticism from some consumers that is effecting Fukushima’s economy. In the afternoon, some bilateral meetings occurred between the foreign ministers of some Pacific Island countries and Japan’s Minister of Foreign Affairs. MOFA organized individual tours for journalists whose countries were not involved that afternoon. Later in the day a Senior Policy Coordinator of MOFA briefed journalists on Japan’s Free and Open Indo-Pacific Strategy. 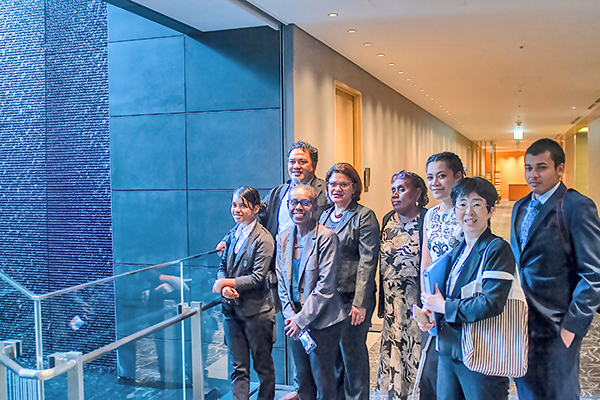 In the morning journalists were transported to cover an Economic Seminar where Pacific Islands Leaders heard about best practices of some major Japanese corporations. PALM Leaders also made speeches extolling the virtues of investment in their home countries. Journalists next covered the beginning moments of a banquet hosted by the Japan-Pacific Islands Parliamentary League before having their own quick lunch on the 30th floor of Tokyo’s first earthquake resistant building. After lunch the journalists made their way to the Imperial Palace where Pacific Island Leaders would have a reception with Emperor Akahito and Empress Michiko and his family. Such a reception is an honor forwarded only to heads of state. A few of us were allowed to photograph the reception line and then were escorted around the building to take photos as they said goodbye to the Pacific Island leaders. Most photographers never get an opportunity to photograph the Emperor and Empress. This was my second opportunity and will be my last. Emperor Akihito, who is 84 years old, will be the first Emperor to abdicate his throne in 200 years. The last Emperor to abdicate was Kokaku in 1817. In the spring of 2019, Emperor Akihito’s son, the Crown Prince Naruhito will become the 126th occupant of the chrysanthemum throne and will assume his father’s responsibilities. If legendary monarchs are included, Emperor Akihito’s line of succession stretches back 2,600 years. After the reception, journalists covered the opening of a welcome reception by Foreign Minister Kono before heading to the train station for a two and a half hour journey to the Spa Resort Hawaiian in Iwaki, Fukushima arriving late at night. The next day, the PALM 8 began in earnest. Journalists covered the arrival on a special train in Iwaki of the Pacific Islands Leaders followed by a memorial for the victims of the tsunami that unfortunately provided no translation for the leaders or journalists. PALM Leaders arrived at the Spa Resort Hawaiian on that afternoon, greeted by Fukushima school students waving flags as the various entourages arrived. Most leaders took the time to greet the students and to pose with them for photos. Some of the journalists had not covered a regional meeting before and were surprised at the stringent guidelines for media practitioners there. Some took the guidelines as a form of censorship. Rather than a form of censorship, the arrangement provided the best camera angles for many photographers and videographers, and also allowed space for pen and paper journalists while also accommodating the needs of the participants in the events. Still, some Pacific Islands journalists railed at having been contained in “media areas”. That evening, the famous Hula Girls put on a special show with stylized costumes representing each country represented at the Pacific Islands Leadership Meeting. The Prime Ministers of Japan and Samoa gave a press conference on the PALM8 Leader’s Declaration, after which some of the journalists departed to Tokyo in preparation for departure to their home countries, having learned a great deal about regional negotiations, and having established great friendships with colleagues from other Pacific Island countries.